Precipitate Drills 10.4 metres of 0 | Precipitate Gold Corp.
Vancouver, B.C. 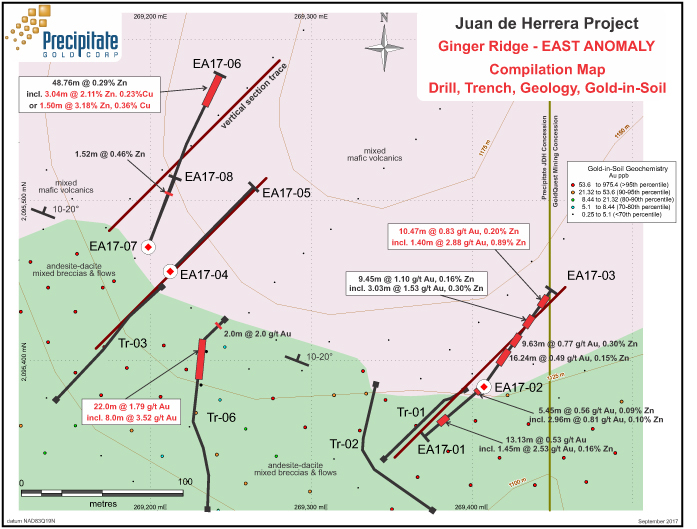 – September 12, 2017 - Precipitate Gold Corp. (the “Company” or “Precipitate”) (TSXV: PRG) is pleased to provide diamond drilling results for the ongoing Ginger Ridge East Zone drill program at its 100% owned Juan de Herrera project in the Dominican Republic. The first phase Ginger Ridge East Zone diamond drill program includes eight shallow drill holes totalling 812 metres, holes EA17-01 to 08 testing a portion of the anomaly. Laboratory results and drill core observations indicate the targeted East Zone volcanic rocks are enriched with gold, zinc and copper mineralization of a possible VMS affinity (‘Volcanogenic Massive Sulphide’). Highlight core sampling results include mineralized drill intercepts yielding 10.47 metre (‘m’) of 0.83 grams per tonne (‘g/t’) gold, and 0.20% zinc (hole EA17-03) and 3.04m of 2.1% zinc and 0.2% copper, including 1.50m of 3.18% zinc and 0.4% copper (hole EA17-06). In addition to the reported drill results, final results for expanded continuous chip sampling of the East Zone’s Trench 6 include highlight values of 22.0m of 1.79 g/t gold, including 8.0m of 3.52 g/t gold (see August 09, 2017 news release). Jeffrey Wilson, Precipitate’s President & CEO stated, “We are encouraged by results received from the initial drill testing at the East Zone, as we now have identified multiple intercepts of gold and base metal values and generated encouraging new technical insight to guide the next phases of drilling within this emerging zone. Initial drill data shows that the East Zone mineralization is extensive and hosted in a volcanic setting similar to GoldQuest Mining’s Cachimbo Zone located only three kilometres on strike to the northwest. 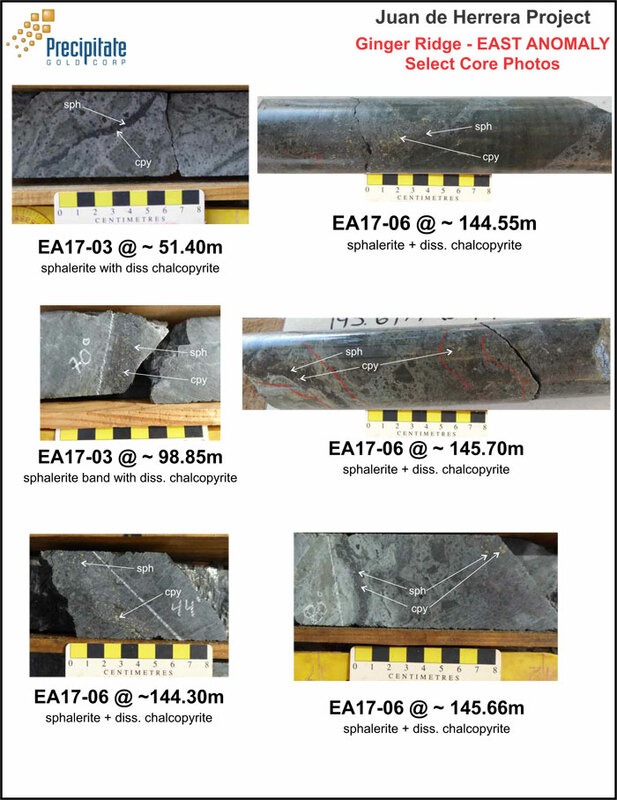 The discovery of zinc-copper enriched rocks in holes 3 and 6 substantiates the VMS working model and provides important guidance in our ongoing data examination and planning. The laboratory analytical results for samples collected in holes 1 to 8 and trench 6 are summarized below. See the accompanying drill-hole location map and three vertical cross-section figures. See also select highlight core photos the Company’s website (www.precipitategold.com). Note: Interval reflects measured core length, as true widths are currently unknown. Shallow depth diamond drill holes EA17-01 to 08 are distributed between three drill pads located within a strike length measuring about 230 metres, testing a small portion of the +1,000 metre long East Zone geochemical anomaly. Results indicate that East Zone gold-zinc-copper mineralization is hosted in shallow northeast dipping (10 to 30 degrees) mixed volcanic breccias and flows of andesite-dacite composition, which are overlain by a younger sequence of mixed mafic volcanic rocks. In general, reported elevated base metal values result from the presence of fine grained sulphides including pyrite, grey-black coloured sphalerite (zinc) and disseminated chalcopyrite (copper) as narrow fracture-veinlet infills, fine sulphide clasts, clots and breccia material; while gold enrichment is often associated with fine grain silica (moderate silicification), pyrite, sphalerite and trace chalcopyrite as narrow fracture infills and narrow vein or veinlets. Follow up drilling at the East Zone will focus on three main objectives, 1) testing gold mineralization proximal to Trench 6; 2) further testing for copper and zinc mineralization identified in holes 3 and 6; and 3) testing the combined chargeability and resistivity induced polarization (“IP”) geophysical anomaly that extends at least 500m northwest along regional strike from hole 6. Core samples were collected under the supervision of Michael Moore, P.Geo. HQ and NTW diameter diamond core was descriptively logged on site, aligned, marked for sampling and then cut in half, longitudinally, using a rock saw. One-half of the core is preserved on site in core boxes for verification and future reference. Rock samples were bagged, sealed and delivered directly to Bureau Veritas (“BV”) preparation facility in Maimon Dominican Republic where they were dried, crushed and pulped. Sample pulps were then delivered to BV facilities in Vancouver British Columbia Canada for analyses (an ISO 9001 accredited facility). Samples were crushed to with more than 70% passing 2mm mesh and split using a riffle splitter (code PRP70-250). An approximately 250 gram sub-sample split was pulverized to minus 200 mesh (74μm). A 15 gram sub-split from the resulting pulp was then subjected to aqua regia digestion and multi-element ICP-ES/MS analysis (code AQ201) and an additional 30 gram pulp spilt subjected to fire assay for gold (ICP-ES finish) (code FA330-Au) for select gold results greater than 0.5 ppm, additionally select samples with highly anomalous copper or zinc values were subjected to additional multi-acid AAS analysis (code MA401); All coarse rejects and pulps are currently stored at BV. Certified standards and local limestone blanks were inserted into sample shipments as a quality control measure in addition to the internal quality control measures applied by the laboratory. Precipitate Gold Corp. is a mineral exploration company focused on exploring and advancing its mineral property interests in the Tireo Gold Trend of the Dominican Republic. The Company also maintains assets in British Columbia and southeast Yukon Territory and is actively evaluating additional high-impact property acquisitions with the potential to expand the Company's portfolio and increase shareholder value.